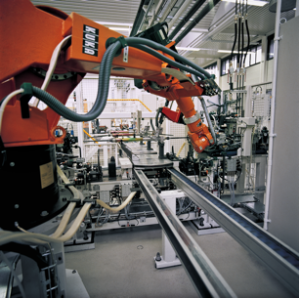 Industrial applications range from machine control, health-care, and robotics to power generation, process control, and transportation. Each of these areas employ embedded processing to perform closed loop autonomous control, have high availability requirements, and are highly software defined. In these applications the designers take advantage of the advancements in processing, communications, software, and system design originating from the consumer world. On top of this foundation they typically make additions or modification to meet the performance, longevity, and reliability needs of their industry. One area where modifications are often required is for distributed coordinated communications. Much of industry transitioned to using an Ethernet physical layer in the early 2000s. However unless strict traffic and access controls are implemented, standard Ethernet is unable to guarantee network latency. This makes it inappropriate for closed loop control where latency and reliability are paramount. To work around this limitation, common practice is installation of dedicated Ethernet networks (sometimes with multiple islanded networks running side by side in the same machine) or the use of modified network hardware layers to support bounded low latency network traffic. 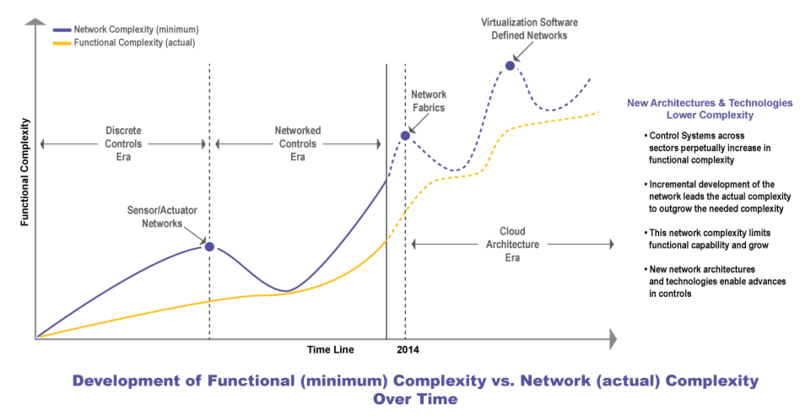 As engineers optimize industrial productivity, control systems complexity has grown. Increasing network capabilities and software abstractions make system design more automated and easier to implement. Today system designers are investing to incorporate IoT concepts into their systems to increase productivity, increase up-time, and improve other key performance indicators. Techniques such as remote system management and maintenance, centralized data collection for big data analytics, and in-built self organizing machine to machine coordination, promise to radically advance next generation industrial control and monitoring systems. To support these capabilities, industrial designers need reliable, converged, remote, secure access to all the components and devices in their designs. This requires fundamental improvements to standard Ethernet so that it will concurrently support both industrial control needs and IoT connectivity and data access. Industrial applications such as machine control require bandwidth, timing, latency, openness, and compliance with IT standards. 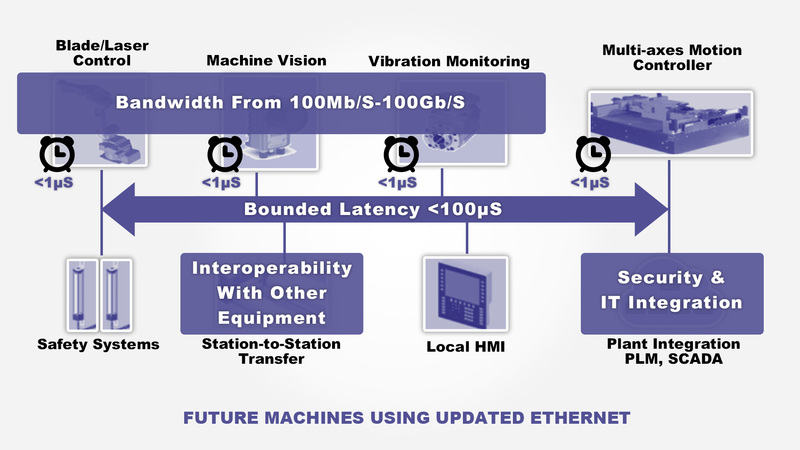 Standard Ethernet is being updated to enable these capabilities. These improvements will enable a single network to support reliable multi-kHz closed loop control and dynamic un-managed standard Ethernet traffic. Because these capabilities are being incorporated in the core Ethernet standard, these upgrades promise broad adoption, increased flexibility, increased bandwidth, multi-vendor interoperability, and decreased cost. John Garrity, Product Line Leader for General Electric Intelligent Platforms. Mike Santori, Vice President Product Marketing, National Instruments. Andreas Dreher, Strategic Technology Manager, Belden. Anthony Neal-Graves, Vice President, Internet of Things Group, Intel. Nicholas Ilyadis, Broadcom CTO, Infrastructure & Networking Group. Kip Compton, VP and General Manager of the Internet of Things (IoT) Systems and Software Group, Cisco. Networking for Power Generation: Advanced networking capabilities to support utility power plant designs. Networking for Industrial Machine Building: Communications and IoT scaled to machine control.